New Delhi: Both major parties – Congress and BJP – were in a close fight in Madhya Pradesh, where Election Commission’s initiative to conduct random sampling of VVPAT machines caused a delay in counting. The vote margins between the two parties was very small in a number of constituencies. 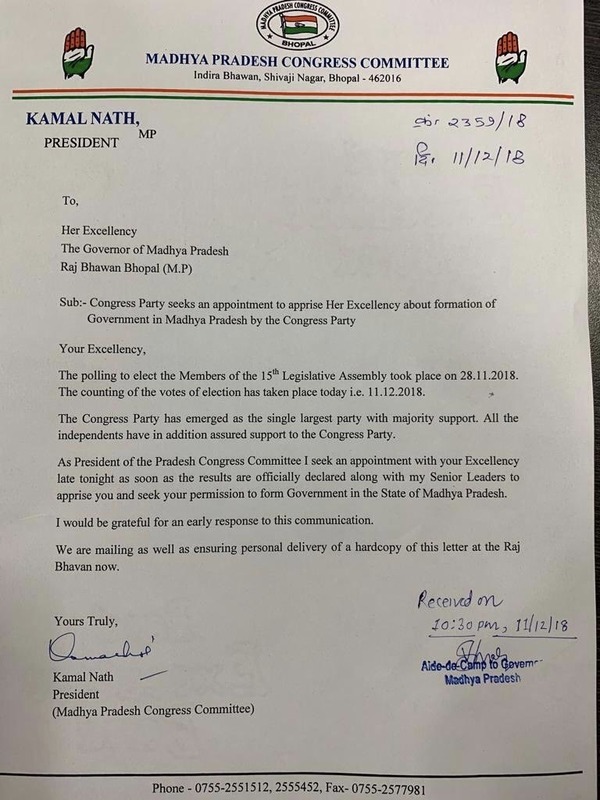 At night on Wednesday, Congress state chief Kamal Nath wrote to the state governor – former Gujarat chief minister Anandiben Patel – saying that his party had the support of all independent winners and was staking claim to form the government. According to ANI, the governor has said that an appointment will be given only after the situation is made clear by the Election Commission. NDTV reported that Patel is likely to meet both the BJP and the Congress on Wednesday. Counting for the 230 assembly seats in Madhya Pradesh began at 8 am on Tuesday with 116 seats needed to win. Official ECI numbers indicate BJP is ahead on 109 seats, Congress on 114 seats and others on 7 seats in Madhya Pradesh. Out of the 194 rural seats in MP, Congress is leading in 100, BJP in 85 while another nine is going to smaller parties and independents. Chief minister Shivraj Singh Chouhan is leading by 6,000 votes from Budhni constituency. However, his minister, Narottam Mishra is trailing by 3,000 votes. Sanjay Singh Masani, Chouhan’s brother-in-law who switched over to the Congress just ahead of the elections, lost the elections. Three ministers – Jayant Malaiya, Archana Chitnis, Ranjana Baghel – are set to lose their seats. In Malwa region, BJP had won 56 of the 66 seats in 2013. This time around, it is winning only 28 and the Congress is gaining there. It it is clear that the BJP is losing a big chunk of its rural voters. It is doing poorly in reserved constituencies right now. 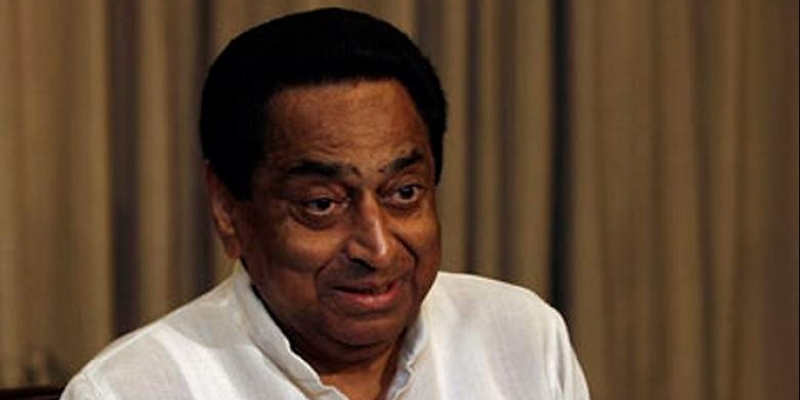 In MP’s Chhindwara, Kamal Nath’s bastion, the Congress is set to win in all seven seats. Congress won in Mandsaur by a good margin. This is where Rahul Gandhi kicked off his campaign. Polling was held on November 28. While there were 2,899 total contenders, including 1,094 independents, the main contest throughout was between the Congress and BJP. Opinion polls in early November pointed to the BJP continuing its reign in the state for the fourth straight term. Exit polls, however, predicted a photo finish. The deciding factor in MP will by the Malwa-Nimar region which has 66 seats. in 2013, BJP secured 56 of these. The other significant factor that will decide the election will be the performance of parties in the 82 reserved constituencies. The BJP won 60 of these in 2013. The present caretaker of the state, Shivraj Singh Chouhan, despite allegations of large-scale corruption and nepotism, has during his three terms enjoyed considerable popularity among Madhya Pradesh’s predominantly rural electorate. Chouhan, however, battled not just anti-incumbency this time around but also a resurgent Congress – led by the trio of Kamal Nath, Jyotiraditya Scindia and former chief minister Digvijaya Singh. The Gwalior-Chambal has 34 seats. Seven ministers in Chouhan’s government are from here. Vindhya Pradesh has 31 seats and the one to look out for will be Rewa from where industries minister Rajendra Shukla is contesting. Bundelkhand has 32 seats and the BJP had won 24 in this impoverished region. Mahakoshal has 31 seats. Both the Congress and BJP state presidents – Kamal Nath and Rakesh Singh – belong to this region. Thus, it has turned into a prestige region for both the parties. This is also an Adivasi-dominated area. Masani, Chouhan’s brother-in-law who switched over to the Congress, is contesting from Varasini seat here. Congress kicked off its campaign with focus on temple politics. Writing for The Wire, Anup Dutta pointed out that in its manifesto too, Congress played the soft Hindutva card to woo Hindu voters, traditionally seen as the BJP’s vote bank. The manifesto promised to build gaushalas (cowsheds) in every gram panchayat, set up new a adhyatmik vibhag (department for spirituality) and open new Sanskrit schools across the state. The manifesto also announced Congress’s plan to put a ban on RSS shakhas in government buildings. As the campaign matured, the grand old party shifted focus to the brewing agrarian distress, promising loan waivers and better prices to farmers. Frequently-occurring corruption scams like Vyapam, illegal sand mining and favouritism under Chouhan also dominated the Congress campaign. Demonetisation and its fallouts severely hit the rural economy in the state, but the anger of it was mainly directed at the Central government. BJP, on the other hand, held on to the narrative of improvements in basic infrastructure facilities like electricity, roads and water. Throughout its campaign, it brought up the topic of how poor these basic facilities were in the state 15 years ago, in the process turning Congress chief minister Digvijaya Singh into a villainous figure. However, battling a three-term fatigue, the saffron party, eventually, fell back on its age-old Hindutva issues to consolidate Hindus even as the national leadership of the BJP maintained that it was only focussing on development-related issues. Since 2003, the BJP has trounced the Congress comprehensively. However, the grand old party has been increasing its vote share in each of these polls. From around 32% in 2003 in the last decade, Congress increased its vote share to around 37% in 2013.